The importance of health can’t be understated. Think about it: Your health is truly the foundation of your life. When you don’t physically feel well, the rest of your life suffers, too. Without it, you can’t focus, and ultimately, you can’t pursue your goals. People go to extreme lengths to feel healthier. Think of all the fad workouts and diets you’ve heard of or maybe even tried yourself over the years. Whether it’s cutting out carbs, eating vegan during the week, hitting a Crossfit gym or trying aerial yoga, it’s all for the sake of your health. These trendy ways to lose weight and stay in shape can be fun for a while, but they don’t often result in a sustainable lifestyle change. Instead of becoming a healthier version of yourself, you burn out, get frustrated and stop trying to improve altogether. There’s a way to break the vicious cycle, and it starts with implementing small, but impactful changes into your life that you can follow through with. There are products that allow you to feel more physically strong and mentally clear without compromising your health or your time. 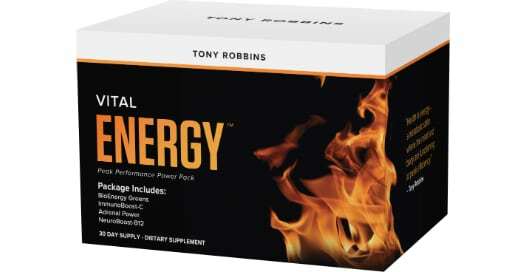 Tony Robbins has developed a new line of health products that were specially formulated to keep you in peak health. Featuring nine new physician-grade products, the line includes products ranging from high-energy protein bars to vitamin-packed powders and superfood supplements. Ready to see a change in your health? Find out more about the new products below. For decades, Tony Robbins’ work has centered on enabling people to transform their lives. A crucial part of that journey is discovering the energy to make lasting changes and feel a sense of joy and vitality. When you feel better, and have realized the importance of health, you have the energy needed to make a bigger impact on your family, career and within your community. An effective pre-workout formula that helps you maintain high energy levels while sustaining mental clarity. The powder is made with non-GMO ingredients, naturally sweetened with stevia and is available in a refreshing strawberry flavor. Easy to mix and drink on the go, Energy Now is your best solution for maximizing your workout. This superfood-packed supplement helps you get in those dense nutrients you need to maintain peak health. The antioxidant-rich powder includes four full servings of fruits and vegetables in every scoop. When you’re traveling or around others often, it’s easy to get sick. This effervescent dietary supplement provides a nutrient-rich blend of essential vitamins to bolster your immune system, focusing on Vitamin C for a boost to the system. A straightforward approach to detoxing, Pure Body Cleanse is a 10-day program designed to aid the body in eliminating harmful toxins. With V-protein powder, Target Detox and DigestEase, you’ll have everything you need to flush the body and get back to optimal health. 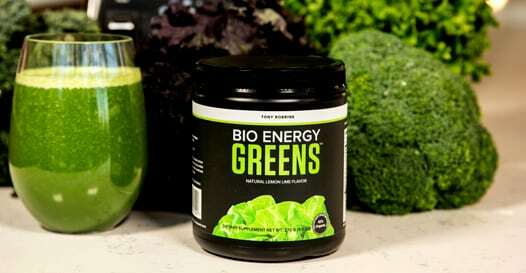 This peak performance pack contains BioEnergy Greens, ImmunoBoost-C, Adrenal Power and NeuroBoost-B12 to help you create and sustain maximum levels of energy. This potent combination of products enables you to prevent illness, experience mental clarity and feel a greater sense of endurance. 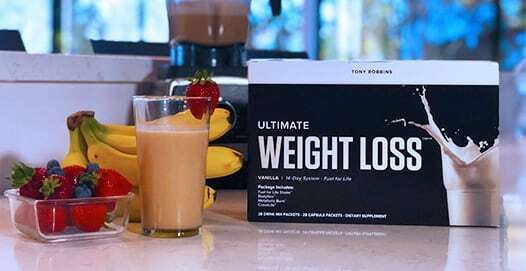 Available in chocolate and vanilla, these custom weight loss formulations were designed to help you hit your weight loss goals in just two weeks. As delicious as it is effective, the shake formulation was designed to keep you feeling full while giving your metabolism a boost. What could you accomplish if you were living in peak health? Would you be a better family member and friend to your loved ones? Would you break down more barriers at work? Would you be able to give more back to the community, or even the world? Don’t wait any longer to realize the true importance of health. Your health is your foundation; it is at the core of everything you do. 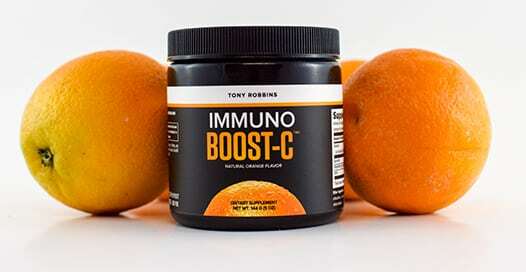 The new products in Tony Robbins’ health line were designed to help you feel your best. When you feel your best, you perform better in all areas of your life. Why wait to make a lasting change? Buy from the new line today and prepare to feel renewed energy and mental clarity. Ready to achieve the body you've always desired? Download Tony’s free digital health guide which offers expert fitness tips, health podcasts, and a nutrition guide. Perform at your peak today!